Holidays can be a time of celebration, a time when family comes together to cook, eat at the family table, and join in family traditions like watching a football game on TV, frying turkeys on the porch, and playing competitive games in the backyard. Some families jump into the family car and go pick out that perfect Christmas tree; the tree they will gather around on Christmas morning all filled with Christmas joy as everyone anticipates opening their gift. For youth in foster care, the holidays can trigger emotions that are buried deep. Holidays are meant to be spent with family; however, children in foster care experience loss of their parents or have a longing to be with their brother or sister they have been separated from while in the state foster care system. 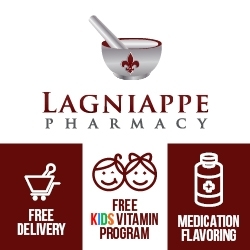 Currently, there are approximately 350 children in foster care who are available for adoption in Louisiana; 145 of these children have no potential family resource, and unfortunately, many of the children are separated from their siblings while in care. Louisiana Heart Gallery raises awareness for foster care adoption and finding forever families for these children. Louisiana Heart Gallery’s success is credited to its volunteers who have a heart to help the fatherless of our great state. These volunteers are families who foster and adopt, professional photographers who give of their time and talent to take beautiful pictures of these children to be displayed on the Louisiana Heart Gallery exhibit and website, and professional videographers who create amazing videos of these children to help recruit families to adopt them. Louisiana Heart Gallery also helps meet specific needs for these children throughout the year, for example, purchasing a cheerleader uniform, paying for athletic fees, providing a laptop for school, just to name a few. One need last year was helping to purchase gifts from the children’s Christmas wish list which led to Louisiana Heart Gallery starting the Christmas Joy Project. The goal is to connect with families in our community who want to purchase a gift from their list and bring them joy on Christmas morning! Last year, the people of Louisiana responded so well that every child was matched with 2-3 families who bought items from the children’s wish list. Not only did families respond to the project, but businesses responded as well. The additional donations from the businesses were used to purchase much needed extracurricular items for the children who live in the group homes. What joy these children received for Christmas! This year marks the second annual Christmas Joy Project but to succeed we need you! 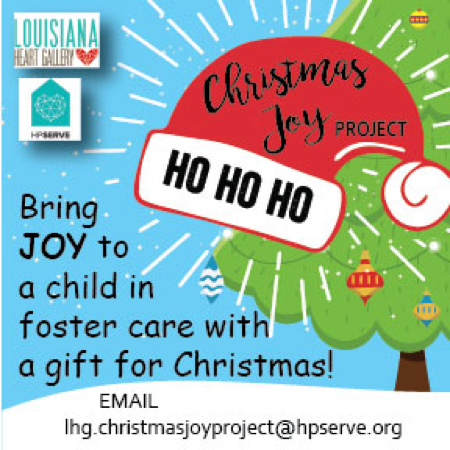 If you would like to bring Christmas Joy to a child available for adoption in the Louisiana State foster care system or you are a business or corporation that would like to “adopt” a group home and provide Christmas Joy for their youth and home needs, please email lhg.christmasjoyproject@hpserve.org. We will send you the wish list and coordinate gift pick up.